11 Jun Filed under F!D Luxe, Sister Allison V. Smith, Travel. Sister Allison has been on the road again. 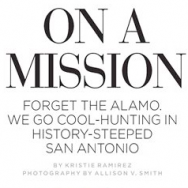 This time she documents the great city of San Antonio for the current issue of F!D Luxe. Turns out there is more to know and love than the Alamo! Have a great weekend! Safe travels – near and far!